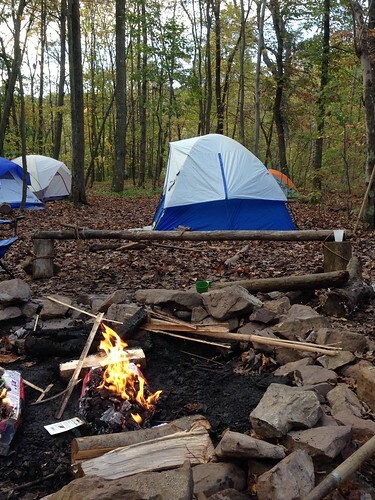 What do you get when you take a sixth grade boy and put him in charge of a little crew of younger scouts? That was exactly what we decided to discover when my older son took on the job of Den Chief for a den of wolves (2nd graders) this year. He has done a great job helping the den leader during meetings so far this year, but the true test of his leadership skills came when we ventured out on a camping trip with our Pack. He sprang into action, wrangling the boys as they played in the trees near our campsite and helping out on our day hike at Hawk Mountain. I knew he would take his job seriously, but I was still surprised to see just how much of his heart he plunged into looking after the younger boys. He'd get frustrated when they didn't listen to him, and was exhausted by the end of our hike. You see, even though EACH child in our group had a parent present on the hike, he still took personal responsibility for keeping them safe. He counted them each time we left a new lookout. He talked to them about what Boy Scouts do on the trails. He was so tired! I had to chuckle when he came up to me and declared, "It is so exhausting to work with a group of boys. It's so hard to get them to listen!" Yeah, welcome to my world, buddy. People think teachers have an easy job, right? Even this eleven year old can tell that isn't true! After a brief nap on the car ride back to camp, though, he was ready to dive back in. While I was talking to a group of parents, I looked up and noticed that he was teaching the younger boys how to tie a special kind of knot. They would disappear into the trees, and come back lugging small logs. After a few minutes, I started to figure out what they were doing. See that bench? The one behind the fire? He got the boys rounded up and they MADE that bench from the wood around the campsite. He lashed the pieces together, and the boys kept sitting on it to test how much weight it could hold. When I realized what he was doing, I felt so proud. I watched quietly from the sidelines. I kept my ideas and commentary to myself, waiting to see how it would all turn out. He channeled the boundless energy of those little boys into a practical project that helped solve a small problem at our campsite. Well played, my son. This is one of the things that is missing from single age classrooms. Having mixed ages gives kids the chance to take on a variety of roles in a group. Even though my son is the youngest boy in his Boy Scout Troop, he's trying out his leadership skills when he helps out with the Cub Scout dens. Those leadership skills will prove to be a huge asset as he advances in his own Troop and takes on leadership roles there. I may not have been excited to head out on this camping trip. I may have been worried about whether or not I could handle the tent, or if the weather would cooperate. Let me tell you, though, I was certainly pleased to get this little insight into the growing confidence of my son. 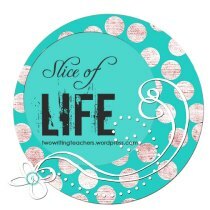 I'm participating in the Slice of Life Challenge, hosted by the amazing educators at Two Writing Teachers. We write and share on Tuesdays. Stop by to see what others are posting!